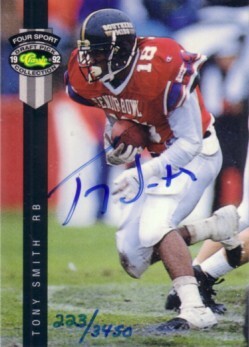 1992 Classic Four Sport certified autograph card of former Southern Miss star running back Tony Smith (he was Brett Favre's main weapon out of the backfield). Numbered out of 3450 produced. NrMt-Mt or better. ONLY ONE AVAILABLE FOR SALE.